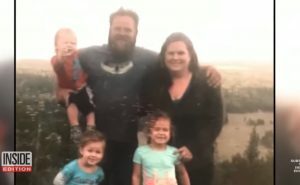 An Arizona lawmaker is calling for an investigation of child protective services, after a SWAT team kicked down a family’s door with guns drawn to remove three young children with the flu in the middle of the night. Parents Sarah Beck and Brooks Bryce took their 2-year-old son to a naturopathic doctor when his fever reached 105 degrees. Because the child had not been vaccinated, the doctor feared he might have meningitis and ordered the parents to take him to the emergency room. Shortly after leaving the doctor’s office Beck says her son started feeling better. So she decided not to take him to the ER, in part because she was afraid of how they would react to him not being vaccinated, according to CNN. When the doctor found out they never made it to the ER, she called the Department of Children’s Services, who called the Chandler police department, who came and attempted to check on the child. Frightened, the parents did not let them in, and instead spoke to the police through windows and by phone. Later that night, after obtaining a warrant, a SWAT team came back, kicked in the door, guns drawn, and removed the 2-year-old boy and his two sisters, age 4 and 6, who had also sick and vomiting. “It’s the type of stuff you see when there’s a hostage shootout, violent criminals, the cartel, not when a child has a fever,” the family’s attorney Nicolas Boca said. State representative Kelly Townsend, who helped pass legislation requiring DCS to get a search warrant before removing children from a home in a non-emergency situation, is troubled by the video. She never expected the legislation to be used like this, she tells ABC News. The children are now in the temporary custody of their grandparents until the matter is settled in court.